What do your hunting packages include? Our three-day packages include full use of our spacious private hunting lodge at Cave Mountain Ranch, generous home-cooked hunters' meals, and experienced guide service to give you the absolute best hunting experience ever. We are a private preserve and selectively breed our stock to provide whitetail bucks with impressive trophy racks. Our hunting area is surrounded with compound fencing and reserved for the exclusive use of our guests. Please contact us for details of guest amenities. 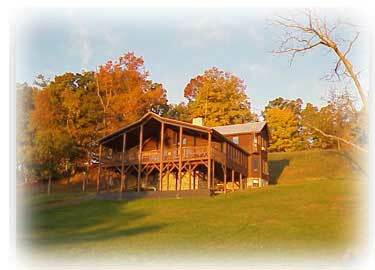 Where in West Virginia is Cave Mountain Ranch? Since Cave Mountain Ranch is a private preserve, we do not publish directions on our website. We are located near Petersburg, West Virginia, in the Grant County section of the Potomac Highlands. We are easily accessible from D.C. and the Eastern U.S. via Interstate 81 and Route 55 West. We provide detailed driving directions to registered guests. The Grant County WV Regional Airport can also serve private flights. What types of weapons are allowed? We conduct hunts for those using guns, bows, or muzzleloaders. When is buck hunting available? Our buck hunt season runs for three months each year, starting September 1 and ending December 1. Our season can expand when the herd shows promise, so contact us about other possible dates. Hunting slots fill up early, so reserve your place well in advance to avoid disappointment. We will be glad to discuss private retreats and other outdoor recreational opportunities with your group. West Virginia provides year-round activities for outdoor enthusiasts. Do we need hunting licenses? Yes, the State of West Virginia requires hunting licenses for preserve hunts. Other fees or permits may be required. Since State rules are subject to change, please consult us at the time you book your hunt. You may purchase hunting licenses at the State's website (www.wvdnr.gov) using a credit card. Licenses and field tags are printable at the time of purchase.